The Israel Defense Forces (IDF) is in a race against time, and it is a race that is relevant to how other Western powers will also deal with the rise of radical, armed, Islamic groups proliferating across the Middle East. As the IDF's commanders look around the region, they see heavily armed, hybrid, Islamic sub-state foes that are replacing states. The traditional threat of hierarchical armies is fading quickly away, into obscurity. The Sunni and Shi'ite jihadist entities on Israel's borders – Hamas, Hizballah, ISIS-affiliated groups in Syria, Jabhat Al-Nusra, as well as elements of Iran's IRGC forces – are all building their power and preparing for a future unknown point in time when they will clash with Israel. The IDF is preparing, too, but it is not only counting how many soldiers, tanks, fighter planes, and artillery cannons it can call up in the next round. The IDF is in a race to adapt to 21st century Middle Eastern warfare, which bears no resemblance to how wars were fought in the 20th century. In this new type of conflict, enemies appear and vanish quickly, use their own civilians as cover, bombard Israeli cities with projectiles, seek out the weakest link in Israel's chain, and send killing squads through tunnels to attack Israeli border villages. In this type of clash, the enemy looks for a 'winning picture' at the start of any escalation. This means landing a surprise blow that will knock Israeli society off balance, at least for a short while. To be clear, all of the hostile sub-state actors currently are deterred by Israel's considerable firepower and are unlikely to initiate a direct, all-out attack right now. The price they would pay for such action is deemed too high, for now. Yet, opportunities and circumstances can suddenly arise that would alter these calculations, and put these terrorist organizations on a direct collision course with the IDF. Israel has fought four conflicts against Hamas and Hizballah in the past 10 years, and emerged with the conclusion that the era of state military versus state military warfare is over. Acknowledging this development is one thing; the organizational transformation that must follow is quite another. 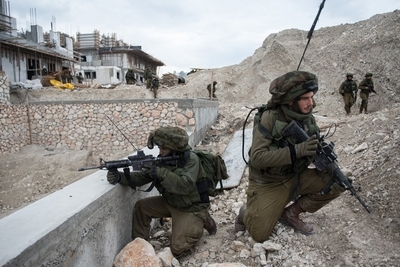 Israel did not want to enter any of the past four conflicts that were forced upon it, but since they occurred, they have aided in the IDF's adaptation process, which has been as complex as it has been painful, and is far from over. "What you have to do against an enemy like this, and it is a great difficulty for militaries, including the IDF, is to operate in a combined, cross-branch [air force, ground forces, navy] manner, and to keep it [operations] focused. Focus the ground maneuver and firepower, on the basis of the intelligence you get," a senior IDF source said earlier this month in Tel Aviv, while addressing the challenges of adaptation. Taking southern Lebanon, the home base of Hizballah, as an example, the area has well over 100 Shi'ite villages that have been converted into mass rocket launching zones. With one out of every 10 Lebanese homes doubling up as a Hizballah rocket launching site (complete with roofs that open and close to allow the rocket to launch), Hizballah has amassed over 120,000 projectiles – some of them GPS guided – with Iran's help. This arsenal, pointed at Israel, forms one of the largest surface to surface rocket arsenals on Earth. Would sending several military divisions into such an area be sufficient for Israel in stopping the rocket attacks? Without focused intelligence, the military source argued, the answer is a resounding no. Israel's reliance on intelligence has never been more paramount in the age of sub-state, radical enemies. "The urban areas swallow up our forces. If we can't focus the maneuver, no amount of forces will be sufficient in dealing with this issue. It must be focused, and the information that must direct this focus is real-time intelligence," the source said. The IDF's Military Intelligence Directorate has the mammoth task of building up a battle picture and a database of targets ahead of any conflict. After a conflict erupts, it must start the process all over again within a few days, when the entire map of threats changes in the modern dynamic battlefield. This is a far cry from the old intelligence work that looked at enemy tank divisions and infantry formation. IDF planners believe that any future conflict with a hybrid, terror-guerrilla military force will consist of five stages. An "opening picture" – that surprise blow intended to shock Israelis – will mark the start of hostilities, in which Israel must deny the adversary its "winning picture." This will be followed by an exchange of firepower. After a few days, Israel would need to call up reserves, and then launch a ground offensive. Throughout this period, the Israeli home front would absorb heavy rocket fire, while the Israel Air Force would pound enemy targets. The IAF could fire thousands of precision-guided munitions every 24 hours, if it deploys its firepower to the maximum, as it would in an all-out clash with Hizballah. Israeli air defense systems like Iron Dome could soften the blow to the home front significantly, but this is truer with respect to Gazan rockets than against the downpour of Hizballah rockets and missiles, which would overwhelm air defenses. The ground offensive must destroy "70 to 75 percent of [enemy] capabilities," the source said. "If there are 100 missiles and two operatives on the other side, and you kill the operatives, than the missiles become irrelevant." The last phase is the end stage, and it is unlikely that an entity like Hamas or Hizballah would wave a white flag when hostilities conclude, even if most of their capabilities have been destroyed. The era of clear-cut military victories, like Israel experienced in the 1967 Six Day War, is gone, the source said. With this reality in view, the IDF's steps to adapt itself to modern threats include the ability to gather huge quantities of intelligence and deliver them, in real-time, to the forces that need them most in the battlefield, right down to the level of a battalion commander. This requirement includes establishing an "operational Internet," an internal IDF network that allows battalion commanders to access Military Intelligence target data in their area, and direct their units accordingly. It would also allow field commanders to communicate directly with a fighter jet pilot or drone operator, or even a missile ship commander, for the type of cross-forces cooperation the IDF thinks will be most effective in shutting down threats. As a result, the IDF's C4i Branch has spent recent years overcoming many hurdles and objections and integrating the command and control networks of the air force, navy, and ground forces. It then directly linked them up to Military Intelligence. By the end of this year, the first IDF division will have a "military Internet" network, complete with applications and browsers, up and running. "I don't want a squad commander walking around with a screen in his hand. He has to be aware of his soldiers. [But] the battalion commander should certainly have this," the source said. In 2014, the IDF did not do a good enough job in detecting, in real-time, the location of Hamas rocket launches in Gaza. It got away with this failure because of the effectiveness of the Iron Dome anti-rocket batteries. But against Hizballah's much larger arsenal, no amount of air defenses will be sufficient, and the IDF therefore is working on improving its rocket detection and accurate return fire abilities. "In the next stage [of our development], if you detect the rocket launch areas and the centers of activity of the enemy, and transmit them [to your own forces], you can learn the enemy's patterns better," the officer said. Knowing the enemy has never been more important for Israel's ability to defend itself against the jihadist entities that are replacing states in the Middle East. As these radical Islamist organizations prepare for the day of battle, Israel does the same, through updating its old 20th century battle doctrines and bringing them up to speed with its rapidly changing and chaotic environment. I cannot understand the hatred in this world..Especially shown by the so-called," Religion of Peace"
What makes people believe that statement ? The only Peace the Islamists will accept is,Total submission. It is this author's opinion that the time to pay heed to world opinion must come to an end if Israel is to survive its next war. The world will have to deal with the fact that there must necessarily be civilian casualties so long as civilians, whether willingly or unwillingly, permit terrorist groups to operate in their homes and structures. Israel will have to take her gloves off and literally annihilate anything that breathes in the areas being used to stage or launch attacks from. The only reason South Lebanon was not turned into a smoldering pile of rubble is because of Israel's value of life. This can no longer be a detractor from what will be necessary to ultimately and soundly defeat the enemy in the new style of warfare that has erupted. All forces need to be adapting to the new war footing asap. I think Israel is going to have to face a very hostile border to the North East very soon. Hizballah may well corridnate with other militants in the area, if only by timing attacks to get the most out of them. In the end Hamas and Hizballah have to many sectarian differences to truly work together, but a stick in the eye by one is a help to all. Hamas has limited weapons capability, but does know the old IDF playbook pretty well. Hizballah has the weapons, but have to deliver any attack thru stand off points. Unless they can get the IDF to commit to moving into their strongly held areas, prior to a proper hammering by bombs from planes and tanks, they will run low on good weapons quickly. I do not think Egypt will mount an attack, but some of their commands are still controlled by the M Brotherhood, and they may launch short lived attacks, which could divert IDF resources. All in all we all need to constantly re-evaluate our ways of warfare to meet these new threats.